Style: High rye rye, finished in Caribbean rum casks. Thanks to Oscar for help in obtaining this bottle and Amy for splitting it with me. Nose: Butter rum, carrot cake, almond brittle. On the palate: Medium bodied, sweet and spicy. Fruitcake (the good, homemade kind), crystallized ginger, allspice, nutmeg, clove, mace, molasses. Finish: More spice cake with a good bit of alcoholic burn. Clears out the sinuses and the sweetness lingers on the tongue and lips. Parting words: This is another special release from this year that I have delayed reviewing in typical Sipology style. 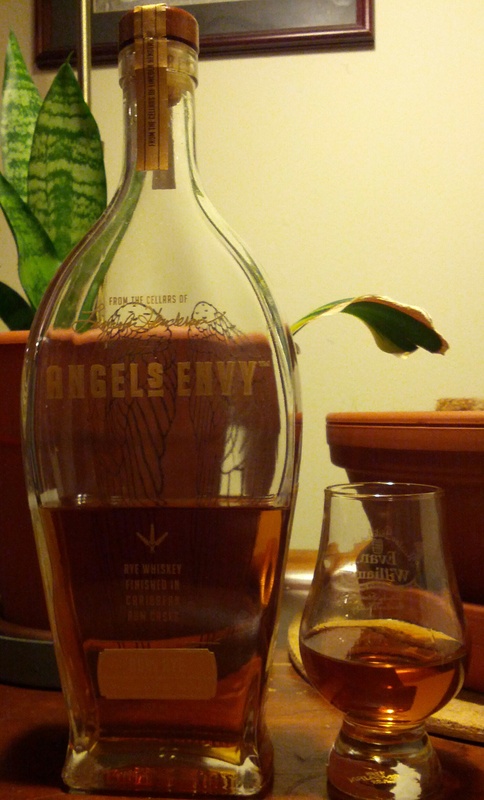 When it was announced that Angel’s Envy was releasing a rye, I was skeptical. When I heard the price, I was even more skeptical. When I tasted it, I was no longer skeptical. This is a whiskey unlike any I have ever had and in a very good way. The rum flavors are very up front and they meld in an effortless way with the spice of the high-rye recipe rye to create a whiskey that is like drinking a 100 proof spice cake. It’s just an amazing product, albeit a very expensive one. It sold for $70 or more when it was to be found but it’s worth every penny and then some. There may be a few on shelves still, so if you see one, buy it. This is an amazing whiskey. Highly recommended. I’m not a whiskey drinker, but one that tastes like rum and spice cake I might like. I think you might! Maybe we can figure out a way to send a sample your way.